Photo courtesy of Iowa State athletics communications. 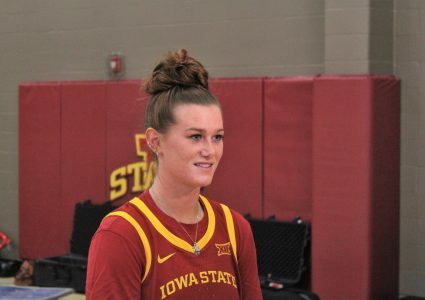 AMES — It isn’t often that basketball fans get to see a player score a career high but Sunday at Hilton Coliseum, Iowa State had two players do so while wearing a Cyclone uniform. Kristin Scott and Alexa Middleton had 21 and 15 points, respectively, to help their team defeat Arkansas 91-82. Middleton finished the night with eight assists and four rebounds to go along with her 15 points in her best all-around performance of the year. The transfer from Tennessee said she wants to build off of that performance as the season goes on. “Personally, I haven’t been doing what I need to do for this team and I think tonight was just the starting point of what I think I can bring to this team,” Middleton said. 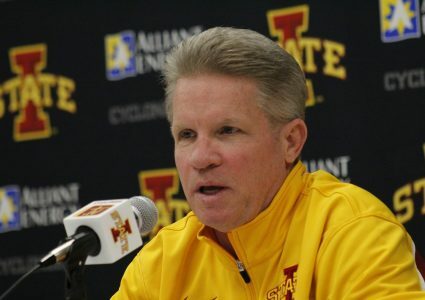 Iowa State was playing its first game of the season coming off of a loss. 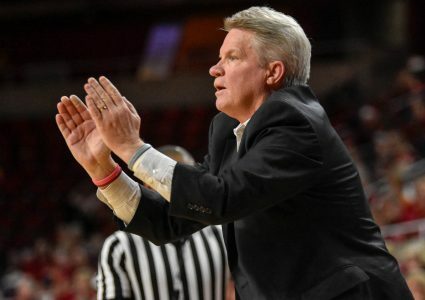 Last Wednesday, the Cyclones were defeated by South Dakota after scoring 18 points in the first half and not have enough time to rally back. While Iowa State was ahead by 12 points entering the fourth quarter, the offense seem to hit a roadblock similar to the one it hit near the end of the Auburn game that made a 10-point lead disappear in a minute. The Cyclones had a couple of costly turnovers that pulled the Razorbacks within three points with 2:43 to play. Fennelly stressed that this is also just how his teams are going to play. They aren’t going to try to avoid losing a game, but rather just go out there and win it. 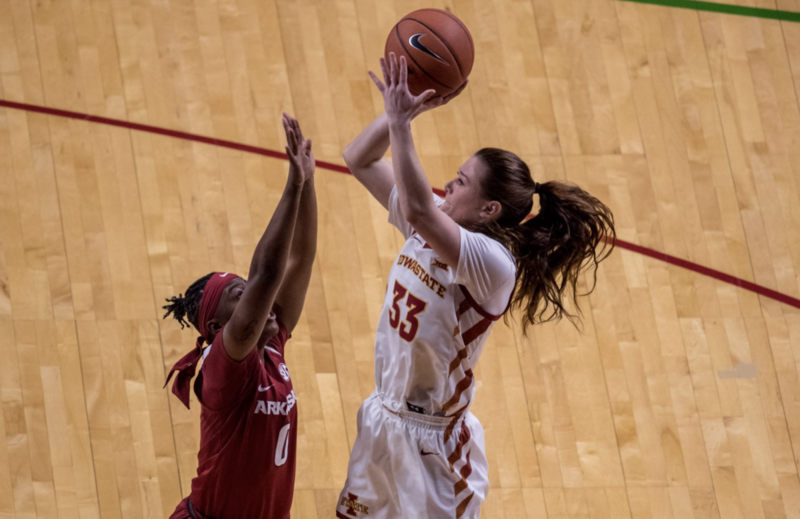 Somewhat overlooked in this one was Bridget Carleton’s team-leading 24 points, although that’s only overlooked because of how much of a scorer she is is for the Cyclones. The Chatham, Ontario, Canada native netted enough points on Sunday to move into 10th on the all-time scoring list at Iowa State. She now currently sits 118 points behind Alison Lacey for 9th on the list with 1,502 career points for the Cyclones. The win improves Iowa State’s record to 6-1 on the season including a 5-0 mark at Hilton Coliseum. The win over Arkansas also marked the first-ever win for Iowa State in the three-year old Big 12/SEC Challenge. Next up for the Cyclones is a matchup with in-state rival No. 14 Iowa. The Hawkeyes are 5-2 on the season and will host Iowa State at Carver Hawkeye Arena on Wednesday night. The game will be televised by BTN Plus and tips off at 7:00 p.m.